Lowell Observatory, Flagstaff, Arizona - Nov. 16, 2018 - At its annual meeting in Flagstaff, the American Association of Variable Star Observers announced a new Exoplanet Database, which will archive long-term follow-up information on interesting planets orbiting stars outside the solar system and allow for powerful collaborations between professional and amateur astronomers. This artist’s concept shows the Kepler-444 planetary system, in which five small planets orbit a distant star. These five planets were detected by the transit method, which involves recording the periodic dimming of a star as a planet transits across its face. Amateur astronomers have been using the same technique to successfully and accurately detect exoplanets for more than a decade, and their observations can now be recorded in the AAVSO’s Exoplanet Database. There, they can be archived long-term and used by professionals and other amateurs to build scientific knowledge of interesting planets. Though exoplanets are difficult to directly observe, data about them can be collected by watching for telltale variations in the light coming from the stars they orbit. Called the transit method because it involves taking a series of images of a star as an exoplanet “transits” across its face, this technique has been used by amateur astronomers to successfully and accurately detect exoplanets for more than a decade. Observers record the periodic dimming of a star, as demonstrated below. The duration and the amount of the dimming, as well as how frequently it happens, tell astronomers about the size of the planet relative to the size of the star, the size and period of the planet’s orbit, and potentially other useful information. 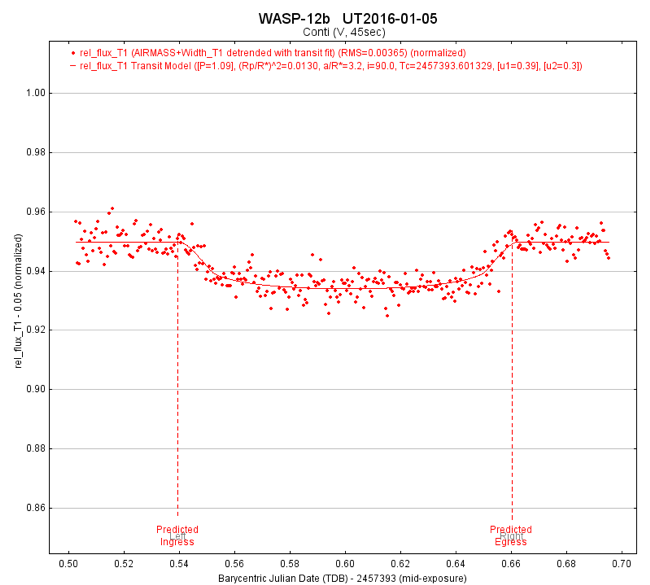 The light curve shown here records the dimming of the exoplanet WASP-12b, taken Jan. 5, 2016, by Dennis Conti, Ph.D., founder and chair of the AAVSO’s Exoplanet Section. Conti used equipment available to amateur astronomers and compared his results to published data to show that he was able to successfully and accurately detect the exoplanet. 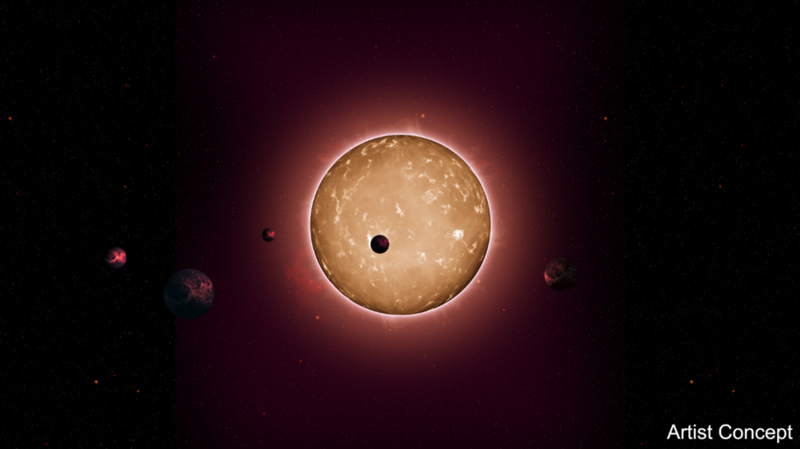 The AAVSO’s Exoplanet Database will provide a place for amateur astronomers following established procedures to make their exoplanet transit observations available to the broader community of researchers, and to have their data archived long-term. Dennis Conti, Ph.D., who founded and chairs the AAVSO’s Exoplanet Section, began observing exoplanets in 2015. When he first heard about the transit method, he could hardly believe it was possible. “I thought, there’s no way for someone with a backyard telescope to detect a planet going around a distant star,” he says. Since then, the group of ground-based observers collecting data on exoplanets has grown. In 2016, Conti coordinated more than 40 amateurs to assist in a professional astronomer’s effort to characterize the atmospheres of 15 exoplanets. In 2017, Conti began teaching an exoplanet observing course through the AAVSO that has educated more than 120 people, ranging from professional astronomers to astronomy instructors to high school students. He authored a guide to exoplanet observing that has been downloaded in more than 60 countries around the world. This growing network of ground-based observers can make valuable contributions to professional astronomical endeavors, Conti explains. For example, as powerful as the Hubble Space Telescope is, it can’t observe a full exoplanet transit because as the telescope orbits the Earth, its view of the target planet gets blocked. With ground-based observations that can take place at various times and geographies, however, a complete transit can be captured. Collecting exoplanet data is particularly vital now because of missions such as NASA’s Transiting Exoplanet Survey Satellite (TESS), which launched in April 2018 and will identify thousands of exoplanet candidates during its two-year survey. During the first one to two years of its mission, TESS follow-up observations will be submitted to NASA’s own database. The TESS Follow-Up Observing Program has collaborated with a trained group from the AAVSO, and recently adopted the organization’s guidelines for best practices. Additionally, amateur astronomer observations submitted to the AAVSO Exoplanet Database for confirmed TESS exoplanets will help refine the ephemerides of those planets, which leads to a more accurate understanding of planet features such as size and orbit. The AAVSO built its Exoplanet Database because existing databases archived only limited information about an exoplanet observation, are focused on data acquired by specific space or ground-based missions, or both, Conti explains. “It became clear that amateurs had no satisfactory place to archive the type of exoplanet observation data that would be useful for professionals to analyze their results,” he says. This database is designed to store data robustly and to be easy to search, either by specific exoplanet or by star system. It is a place where amateur astronomers following established procedures can make their exoplanet transit observations available to the broader community of researchers. It also allows for long-term archiving of observations, which is useful for refining information about exoplanets over time and represents a valuable scientific legacy for the AAVSO. This type of data can also reveal transit-timing variations, slight changes that could indicate that an observed exoplanet’s orbit is being affected by the gravitational pull of another, potentially undiscovered, planet in the system. “The AAVSO has always been at the forefront of collecting and curating observations of variable stars. In the 21st century there is perhaps no more important class of variable stars than those with transiting exoplanets. Amateur astronomers have a vital role to play in monitoring and studying exoplanets in this way, and I am thrilled that the AAVSO is continuing to take a leadership role in aiding amateur astronomers in this important endeavor,” says Kristine Larsen, Ph.D., AAVSO president. The AAVSO’s Exoplanet Database is available online now at https://www.aavso.org/apps/exosite/doc. The American Association of Variable Star Observers is an international, non-profit, worldwide scientific and educational organization of amateur and professional astronomers who are interested in stars that change in brightness—variable stars. Its mission is to enable anyone, anywhere, to participate in scientific discovery through variable star astronomy. For more information, visit www.aavso.org. Los astrónomos aficionados trabajan junto a los profesionales para monitorear, y potencialmente descubrir, planetas orbitando estrellas lejanas. Observatorio Lowell, Flagstaff, Arizona – 16 Nov., 2018 – En su encuentro anual en Flagstaff, la American Association of Variable Star Observers (Asociación Americana de Observadores de Estrellas Variables) anunció la creación de una nueva Base de Datos de Exoplanetas, la cual archivará en el largo plazo información del seguimiento de planetas interesantes que orbitan estrellas fuera del sistema solar y permitirá una importante colaboración entre astrónomos profesionales y aficionados. Esta representación artística muestra el sistema planetario Kepler-444, en el cual cinco pequeños planetas orbitan una estrella lejana. Estos cinco planetas fueron detectados mediante el método de tránsito, que consiste en registrar el desvanecimiento periódico de una estrella a medida que un planeta transita a través de su cara visible. Astrónomos aficionados han venido usando la misma técnica para detectar exoplanetas con éxito y precisión por más de una década y sus observaciones ahora se podrán registrar en la Base de Datos de Exoplanetas de AAVSO. Allí, podrán archivarse en el largo plazo y ser usados por profesionales y otros aficionados para acumular conocimiento científico de planetas interesantes. Aunque los planetas extrasolares son difíciles de observar directamente, se pueden recolectar datos de ellos al observar variaciones indicadoras en la luz proveniente de las estrellas que orbitan. Llamada “método de tránsito” porque consiste en tomar una serie de imágenes de una estrella mientras un exoplaneta “transita” a través de su cara visible, esta técnica ha sido utilizada por más de una década por astrónomos aficionados para detectar exoplanetas con éxito y precisión. Los observadores registran el desvanecimiento periódico de una estrella, tal como se demuestra debajo. La duración y el grado del desvanecimiento, así como cuán frecuentemente sucede, les informa a los astrónomos acerca del tamaño relativo del planeta comparado con el de la estrella, el tamaño y período de la órbita del planeta y potencialmente más información útil adicional. La curva de luz que se muestra aquí registra el desvanecimiento del exoplaneta WASP-12b, registrado el 5 de enero de 2016 por Dennis Conti, Ph.D., fundador y coordinador de la Sección de Exoplanetas de AAVSO. Conti utilizó equipos disponibles para astrónomos aficionados y comparó sus resultados con datos publicados para mostrar que era capaz de detectar exitosamente y con precisión al exoplaneta. La Base de Datos de Exoplanetas de AAVSO proveerá un lugar para que los astrónomos aficionados, siguiendo procedimientos establecidos, puedan poner sus datos de tránsitos de exoplanetas a disponibilidad de una comunidad más amplia de investigadores y tener sus datos archivados en el largo plazo. Dennis Conti, Ph.D., quien fundó y dirige la Sección de Exoplanetas de AAVSO, comenzó a observar planetas extrasolares en 2015. Cuando escuchó por primera vez acerca del método de tránsito, apenas podía creer que fuese posible. “Pensaba, no hay forma de que alguien con un telescopio casero detecte un planeta girando alrededor de una estrella lejana”, dice. Desde entonces, el grupo de observadores terrestres recolectando datos de exoplanetas ha crecido. En 2016, Conti coordinó a más de 40 aficionados para contribuir con el esfuerzo de un astrónomo profesional para caracterizar las atmósferas de 15 exoplanetas. En 2017, Conti comenzó a dictar un curso de observación de planetas extrasolares por medio de la AAVSO del que han participado más de 120 personas, desde astrónomos profesionales a instructores de astronomía y estudiantes secundarios. Ha sido el autor de una guía de observación de exoplanetas que ha sido descargada en más de 60 países alrededor del mundo. Esta red en crecimiento de observadores en Tierra puede realizar contribuciones valiosas a los esfuerzos astronómicos de profesionales, explica Conti. Por ejemplo, por más poderoso que sea el Telescopio Espacial Hubble, no puede observar un tránsito completo de un exoplaneta porque a medida que el telescopio orbita la Tierra, su visión del planeta objetivo queda bloqueada. Con observaciones terrestres que pueden tener lugar en diferentes momentos y localidades, sin embargo, se puede capturar un tránsito completo. Recolectar datos de exoplanetas es particularmente vital ahora debido a misiones como el Transiting Exoplanet Survey Satellite (TESS) de la NASA que, lanzado en abril de 2018, identificará miles de candidatos a exoplanetas durante su relevamiento de dos años. Durante el primero de sus dos años de misión, observaciones de seguimiento de TESS se enviarán a la propia base de datos de la NASA. El Programa de Observaciones de Seguimiento de TESS ha colaborado con un grupo entrenado de la AAVSO y recientemente ha adoptado la guía de la asociación para mejores procedimientos. Además, observaciones de exoplanetas confirmados por TESS de astrónomos aficionados enviadas a la Base de Datos de Exoplanetas de AAVSO ayudarán a refinar las efemérides de esos planetas, lo que llevará a un entendimiento más preciso de características planetarias tales como tamaño y órbita. La AAVSO dio forma a su Base de Datos de Exoplanetas porque las bases de datos existentes archivaban sólo información limitada acerca de una observación exoplanetaria debido a que están focalizadas en datos adquiridos por misiones espaciales o terrestres específicas, o ambas, explica Conti. “Se hizo evidente que los aficionados no tenían un lugar satisfactorio donde archivar el tipo de observación exoplanetaria que sería útil para que los profesionales analicen sus resultados”, dice. Esta base de datos está diseñada para almacenar datos de forma robusta y para ser fácil de interrogar, tanto en busca de un exoplaneta específico como de un sistema estelar. Es un lugar donde los astrónomos aficionados, siguiendo procedimientos establecidos, pueden poner sus datos de tránsitos de exoplanetas a disponibilidad de una comunidad más amplia de investigadores. También permite que se archiven las observaciones en el largo plazo, lo cual es útil para refinar la información acerca de los exoplanetas en el tiempo y representa un legado científico valioso para la AAVSO. Este tipo de datos también puede revelar variaciones de tiempo en los tránsitos, leves cambios que podrían indicar que la órbita de un exoplaneta observado está siendo afectada por el tirón gravitatorio de otro, potencialmente sin descubrir, planeta en el sistema. “La AAVSO siempre ha estado a la vanguardia en recolectar y mantener observaciones de estrellas variables. En el siglo XXI tal vez no haya clase más importante de estrellas variables que aquellas con tránsitos de exoplanetas. Los astrónomos aficionados tienen un rol vital por jugar al monitorear y estudiar exoplanetas de esta manera y estoy emocionada de que AAVSO siga manteniendo un papel de liderazgo al ayudar a los aficionados en este importante emprendimiento”, dice Kristine Larsen, Ph.D., presidente de AAVSO. La Base de Datos de Exoplanetas de AAVSO ya está disponible en línea en: https://www.aavso.org/apps/exosite/doc. La American Association of Variable Star Observers (Asociación Americana de Observadores de Estrellas Variables) es una organización científica y educacional internacional sin fines de lucro de astrónomos aficionados y profesionales que están interesados en estrellas que cambian de brillo —estrellas variables. Su misión es la de permitir a todos, en cualquier parte, participar en el descubrimiento científico a través de la astronomía de estrellas variables. Para más información, visiten www.aavso.org.